I decided to play around with perspective on this one. That came out pretty well, I think. Also played around with the lighting. Character design belongs to Gaiaonline. Another strong submission from windyroller. High quality color work (especially on the back-lighting) and a challenging perspective make for one impressive doujinshi! 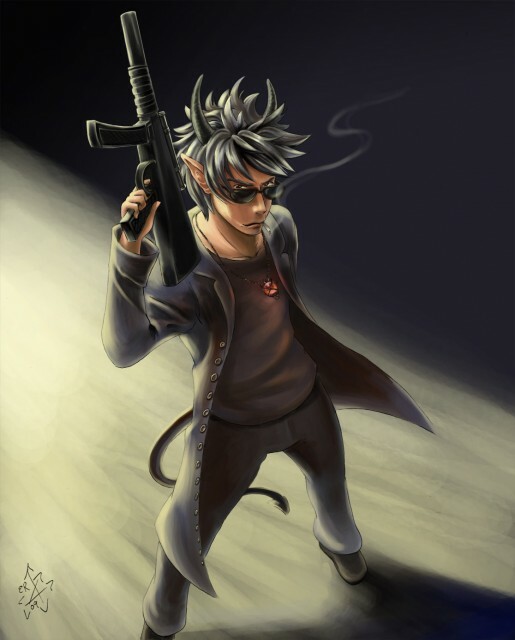 Nice to see other Gaiaonline users in various places.I knew that's where the character was from the moment I saw him.Excellent job on the perspective and the expression on his face,and I would say the gun is half-bad. I like his bad guy pose, with the fag in his mouth. check him out. very cool.